The theory of Aryan invasion of India and the connection between the early inhabitants of India and of Europe both racially and linguistically stretched the imagination of many Indo European historians. It led to a great deal of confusion and distortion of Indian history in the backdrop of British imperialism. The theory trivialized the achievements of the early inhabitants of the Indian subcontinent in religion, philosophy, astronomy, metallurgy, medicine, architecture, urban planning, sea faring, ship building, transportation, literature and mathematics and projected a picture of white man's continuing burden of educating the pagan races and introducing them to the nuances of an advanced civilization. It was as if the British conquest of India was like history repeating itself. The early inhabitants were described as dark skinned, barbarous, irreligious and unclean people in contrast to the horse riding, fierce, warrior like, civilized, religious, fair skinned Aryans. The theory also distracted many historians by creating a mindset that encouraged the search for alternative homelands of Aryans and their possible migratory routes. It established a frame work of Indian history in the academic circles that attempted to trace all the early achievements of the civilization to the so called Vedic Aryans. It precluded the exploration of the country's social diversity and religious plurality from a historical perspective through anthropological studies of populations patterns, habits and customs. It also contributed in some ways, unfortunately, to the racist dogmas of Hitler's Germany and the eventual segregation of that nation into Aryan and non Aryan groups. The close resemblance of sounds and similarity of some root words in Greek, Latin and Sanskrit suggest to their common origin and close affinity. The Aryans used chariots and horses. They were unknown in the subcontinent before their arrival. The Aryans brought with them their Vedas and rituals and introduced a new religion. They Aryanized India and contributed to the development of a rich religious tradition in the country. Through their political power, they enforced their social and religious life upon the native people. They absorbed the vanquished tribes as lower castes in their social order and excommunicated the most savage and reticent tribes as Chandalas or the lowest of the lowly. The flora and fauna and some geographical descriptions mentioned in the Rigveda are not found in the subcontinent. They allude to an earlier homeland that existed in a different climatic zone far away from the subcontinent. The chief deity of Rigveda was fire (Agni). It was a tradition of the early Aryans to keep a fire place in their homes and keep it alive uninterruptedly. It was because the early Aryans lived in a cold region where a fire place was a physical necessity. Some Rigvedic passages refer to the division of a year into nine months (navagaas) or ten months (dasagvas) and only five seasons instead of the familiar six. This was because the early Aryans lived in a colder climate where the sun was not visible for several months and the seasons were fewer. There is no mention of the river Ganges in the earliest Vedic hymns which means the early Aryans were not familiar with the Indian territory east of Punjab. The Vedas speak of Indra as the destroyer of fortified cities. The decline of the Indus valley civilization and the abrupt desertion of its settlements could be attributed to the Aryan invasion. The Aryan invaders attacked these cities and drove away the natives forcing them to migrate eastwards and southwards. The native Indian were familiar with horse before the supposed invasion of Aryans. The word Aryan denoted status or position rather than a race of people. Language cannot be considered a valid criteria to determine the origin of any people since the same people may speak different languages in different periods or speak multiple languages. There is no evidence of large scale invasion of people from outside India until Alexander's time. Vedic culture or religion did not exist outside India. It develop indigenously. Any similarities with neighboring cultural groups may be due to contact rather than common origin. The urban settlements of Indus valley were deserted due to the changes in the climate and the course of the Indus. It does not make sense that having conquered the cities, the Aryans would have left them empty and reverted back to their pastoral and nomadic existence. The racial types prevailing in ancient India were the same as those of today. The skeletons found in the excavations do not suggest the arrival of a new racial type. Most of the descriptions of the flora and fauna, the geography and climate mentioned in the Rigveda suggest to their connection with the Indian subcontinent rather than a colder arctic climate. The river systems, the constellations mentioned in the Rigveda suggest to the existence of the Vedic culture in the Indian subcontinent long before the assumed invasion of the Aryans. The excavations at the Indus valley urban settlements and the ancient site of Dwaraka point to the continuity of an ancient prehistoric native culture rather than an abrupt interpolation or super imposition of a foreign culture. 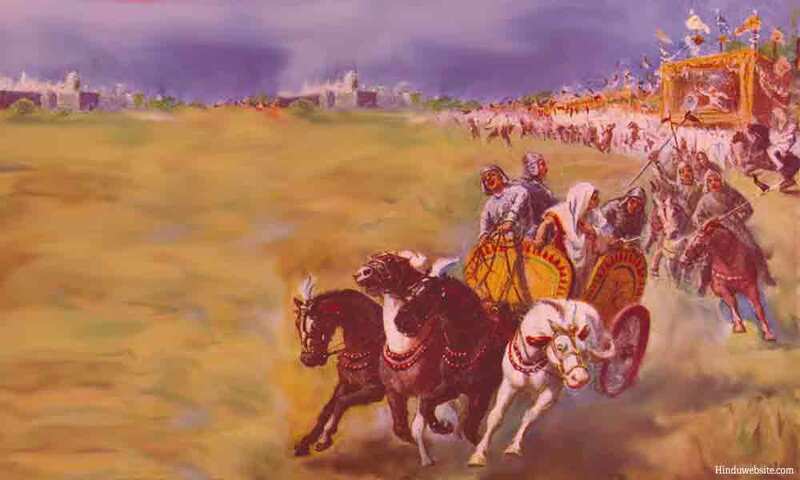 The battles mentioned in the Rigveda such as the battle of ten kings were not fought between Aryans and non-Aryans but among different Aryan groups. It is difficult to believe that the Sanskrit language of the Rigvedic people evolved entirely outside the Indian subcontinent and brought here by the invading Aryans along with their scriptures. There is no evidence of any ancient European tribe or nation ever speaking Sanskrit language. There is also no evidence of any European group reciting Vedic mantras or practicing Vedic rituals based on the hymns contained in the Vedas. India was having a well developed urban civilization long before the supposed invasion of the Aryans. It is difficult to believe that a group of nomadic and pastoral people would have brought an urban civilization on their horsebacks and chariots and introduced it to an already advanced civilization. The most plausible theory seems to be that long before the supposed Aryan invasion, the Indian subcontinent was inhabited by diverse groups of peoples who migrated from different parts of the world. The first wave of migration took place probably about 100000 years ago from Africa to the Mediterranean and from there into southern Asia and finally into the Indian subcontinent 3 . It was followed by several waves of migration from Africa, Asia and Europe resulting in the formation of a multiracial and heterogeneous society by 4000 BC that is characteristic of India even today. Anthropological studies of the prehistoric races based on skeletal studies confirm that many races existed in prehistoric India. Sir Herbert Ripley identified seven racial types 4 , while Dr. B.S. Guha identified six main races that migrated to the Indian subcontinent in ancient times 5 . They were the Negrito, the Proto-Australoid, the Mongoloid, the Mediterranean, the Western Brachycephale and the Nordic. There is no evidence to suggest that a new racial type of Caucasian origin had been added to the subcontinent through an Aryan invasion subsequent to the decline of the Indus Valley civilization. Long before the decline of the Indus valley civilization, ancestors of the Indian people might have migrated from Africa and elsewhere due to changes in climate or nomadic habits. In the course of their wanderings they might have reached the river Saraswathi in the present-day Rajasthan and settled there. They might have either brought with them or developed the knowledge of the rituals and the earliest hymns of the Vedas and secured the patronage of the local rulers. Since their knowledge was special and key to their status and identity, they might have kept the knowledge to themselves and not revealed to others. The prevailing caste system might have helped them to protect their identity and ritual privileges, and gradually evolve a strict code of social and religious conduct that discouraged intermixture of castes and social misconduct. It is equally possible that the people who inhabited the Indian subcontinent during the Indus period and later constituted a heterogeneous group and came from different social, religious, political, and racial backgrounds. Therefore, if there was any migration from outside, it did not happen through large-scale migration or invasions but from small groups that came and settled in the land due to various reasons. Subsequently, political and climatic changes such as the drying up of the river Saraswathi, would have forced some group to proactively migrate to other parts of subcontinent and seek the patronage of new rulers belonging to other cultural groups and traditions. It might have led to adjustments and compromises within their own tradition, reconciliation with other traditions and introduction of new rules to govern the social conduct and caste divisions. Thus in all probability the Vedic religion spread in the subcontinent not through a powerful invasion of foreigners or subjugation of the natives, but through a peaceful migration and dispersion of a minority group of priestly families whose influence grew over a period of time supported by a class of rulers who saw an opportunity in the new alliance to consolidate their own power by elevating themselves to the status of divine rulers and tracing their lineage to the gods. Vedism spread to the rest of India, making compromises here and there, integrating other cultures and divinities wherever required, spreading its influence among the country's free thinkers and by the gradual dispersal of once monolithic community to various parts of country ably supported by the political power of passionate rulers who believed in the new tradition, made it their own and wanted their subjects to follow. 2. It is not the author's intention to suggest that either Abbe Dubois or Max Muller had any ulterior motives in proposing their theories. As academicians they were probably motivated by the prospects of a new discovery rather than any racist bias. It is another thing that the theory developed political undertones in the British imperial India supported by a self-serving ruling class.